There will be no Allan Glens v Lenzie league derby this season. Allan Glens Rugby Club are all geared up and ready for the new season ahead in BT West Division 1. The coaching staff of Ewan Smith, Robert McKinstray and Brian Heneghan have been putting the players through their paces at pre-season training and have won both of their pre-season games against Dunfermline and Cartha Queens’ Park. There are several players returning to the club this season and a few coming out of retirement, most notably Russell McKeown who is the new club captain. He had gone on to play rugby at a higher level and is returning to the Glens, bringing with him experience and a professional attitude as well as a few players in key positions. Both the 1st and 2nd XVs are full of confidence and can’t wait to get the season started. The first league game is away to Newton Stewart RFC on Saturday, followed by the first home game against Oban Lorne RFC. Allan Glens Rugby Academy, the youth section at Allan Glens, is also being trained hard and players want to put in some great performances like they did last season in the SRU Club Youth Conference League. One side Glens won’t face this season are local rivals Lenzie who are now in BT West Division 2 following last season’s relegation. The Viewfield side begin their bid to bounce straight back at the first time of asking on Saturday when they travel to face Stewartry in their opening league fixture. Lenzie’s first three games are all away. They play at Millbrae on September 3 and Paisley on September 10 before playing their first home match against Clydebank on September 17. 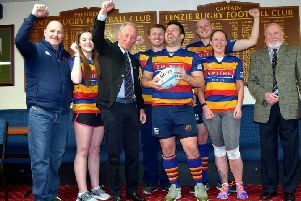 Allan Glens president Scott Muir said: “We would also like to wish our local rivals Lenzie RFC a great and successful season in the coming months. New members and players are most welcome to come along and join Allan Glens Rugby Club or Allan Glens Rugby Academy.